Well-actied movie based on the best-selling books. I actually liked this for the dystopia theme, but the premise of only having one type of personality was a bit hard to believe. That being said, the casting of Shailene Woodley as Tris and Theo James as Four worked great because of the chemistry between the two actors. In both the books and the movie, there are five personality types, and each person goes through a test to determine which one they have when they are 16. The type they choose will determine how they live out their lives. The types are Dauntless for protection, Amity for kindness, Erudite for learning, Candor for truth, and Abnegation for leadership. Tris was born into Abnegation, but she learns she is a divergent because she does not fit into any one category. She cannot be controlled, and this makes her dangerous to the wrong people in power. She selects Dauntless in the Choosing Ceremony, where she thinks she might be able to hide her divergence, and this is where she meets the mysterious Four, her instructor. She learns from her brother, who is in Erudite, that there is a plot to destroy all Divergent types. She tells this to the one person she thinks she can trust, which is Four, and together, the two of them set out to discover who is behind the plot to kill all the Divergents. Well constructed screenplay, but the plot is a bit unbelievable. I watched this movie with my mother and we both enjoyed it very much. It never slowed down and there wasn't anything a family couldn't watch together. I bought a copy for my daughter and we can hardly wait for the end of next month (March) when the final one comes out. Modern technology has everything looking so real. You'll fall in love with the cast. I saw this movie years ago. When I saw I could order a copy of my own I had to have it. This is one of the shows that keeps you wondering what the next step will be. Great show, would recommend. Interesting Sets and Terrific CG Effects! Entertaining. 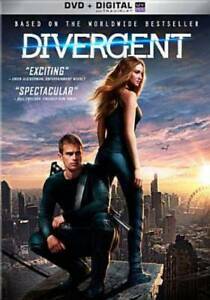 Divergent is set in a world where people are divided into distinct factions based on human virtues. Tris Prior (Shailene Woodley) is warned she is Divergent and will never fit into any one group. When she discovers a conspiracy by a faction leader (Kate Winslet) to destroy all Divergents, Tris must learn to trust in the mysterious Four (Theo James) and together they must find out what makes being Divergent so dangerous before it's too late. Based on the best-selling book series by Veronica Roth. i love it ! you will too! I love this series! im hoping for more movies from this story!